A new low amongst many, many lows. But here I am carrying my lunch back to the office from the local Tesco Express, having loaded a sandwich, a banana and a price-reduced Hoisin Duck Sushi Taster pack into a dog poo bag which I found in my coast pocket. An unused dog poo bag, because I'm not some sort of animal. 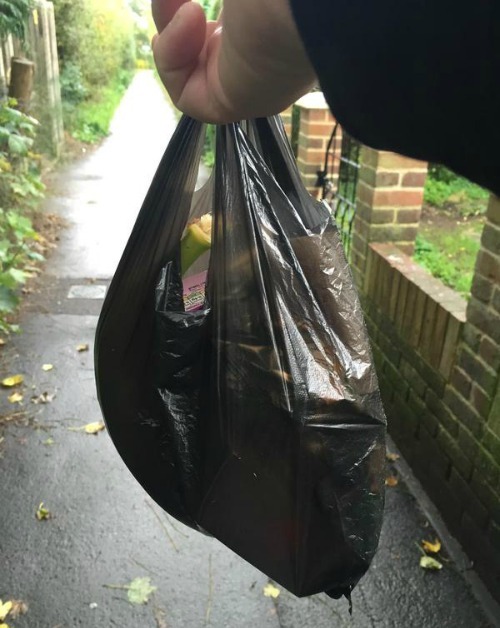 On this - the third day of the government's new tax on single-use plastic bags from supermarkets - I have made a substantial saving of five new pence. I'd treat myself to something utterly luxurious, but even penny chews are probably 10p each these days. Get some reusable bags. Keep some in your car and one in your desk at work. Sometimes you can find some that fold up nicely into a little package. Don't forget to wash them periodically. They tried to pass a similar tax here. They got half way there, the convenience stores don't even have plastic bags any more. They are allowed paper bags but I hate them so I grab a reusable bag now. First World Problems. Aaaaaaargh! Hellllllllllp! A coast pocket? Is that some sort of Cornish cove? Since charging people for plastic bags will lead immediately to the collapse of civilisation and four blokes on horseback making a bloody nuisance of themselves I am curious as to how this has totally failed to happen in for .e.g. Wales. I hope you hung your shopping inna hedge with all the other dog poos.